Heat shock proteins (HSPs) are highly conserved polypeptides inhabiting almost any subcellular compartment. HSPs that are classified according to their molecular weights function as molecular chaperones and are crucially involved in maintaining protein homeostasis and cell viability. Members of the HSP70 family of chaperones represent one of the most ubiquitous classes of chaperones and can be found not only in eukaryotic cytosol, membranes, chloroplasts, ER and mitochondria but also in the extracellular milieu as well as in bacteria and certain archaea where they fulfil specific organellar- or tissue-specific functions 1,2,3,4. In many cases HSP70s can function redundantly. All of the cellular activities of HSP70s depend on their ATP-regulated ability to interact with exposed hydrophobic surfaces of proteins. Herein, focus is given on the regulation, function and disease relevance of the molecular HSP70 chaperones as well as their impact as therapeutic drug targets. 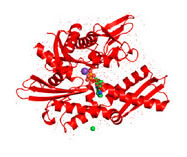 Ribbon and tube representation of the tertiary Hsp70-1 structure in the presence of ADP.